Nothing says spring cleaning to your body like watercress! We love watercress for all of the things that make it different – it’s texture, taste, and even the way that it grows. Did you know that watercress is one of the very oldest herbs? The flavor can actually vary depending on what part of the season it is growing. In the spring it can have a nice light flavor – as it get hotter and further along in the season, it can get hot and mustardy. (Give it a little taste to adjust how much you toss into your recipe.) We love it raw on a sandwich, salad or avocado toast – but you can cook it as well in stir-frys, mix it into dips, cook it into soups! Sold at the peak of freshness. Our watercress is grown and sold to be used right away for the best flavor. 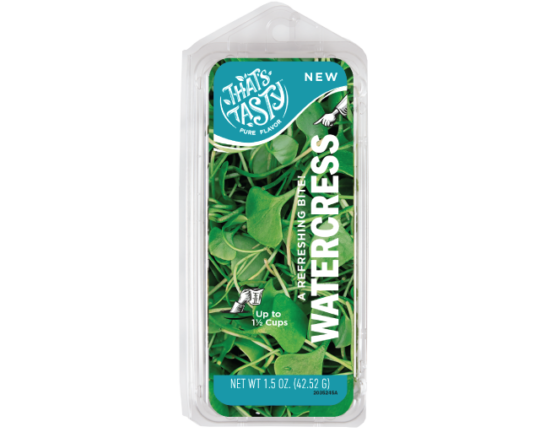 Watercress is happiest inside it’s package hanging out in your refrigerator drawer. Have extra watercress? No problem. Try these fresh ideas for how to use it quickly. Make some fresh watercress tea! It’s a refreshing drink that is also an aid for digestion. Place in a glass jar with water and place in the sun. In a couple of hours you will have a nice watercress sun tea. Drink hot or cold. Make a traditional Potage au Cresson soup. (It’s a super yummy french potato soup that you will love.) Eat fresh or freeze extra portioned containers for a quick lunch for later.